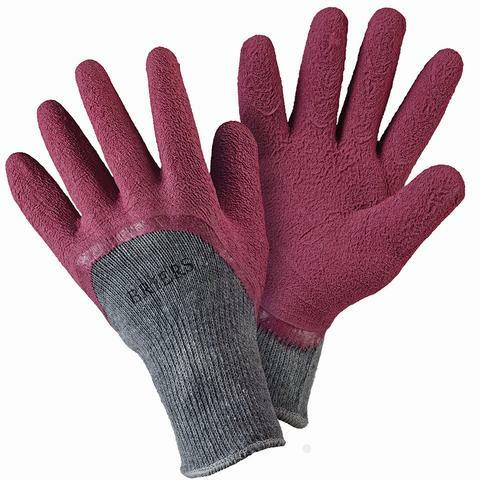 As the name of the gloves suggests, the Briers Claret Warm All Seasons Gardening Gloves B6300 are ideal for tending to your garden no matter what time of year it is. The extra thick liner helps to keep hands feeling snug and warm, while the rippled latex coating on the palms and fingers provides quality grip in both wet and dry weather conditions. The elasticated cuff helps to keep out dirt and debris during even the messiest of weeding or seeding jobs, allowing you to work well with reliable protection and dexterity. The Briers Claret Warm All Seasons Gardening Gloves B6300 are available in a single size that should be suitable for most users. Please measure the circumference of your hand around the knuckles (excluding the thumb) with your hand open and your fingers together, and the length of your hand from the tip of your middle finger to your wrist.